There’s a pressure on professionals who are at the top of their game to take advantage of every opportunity presented. However, just as you wouldn’t go out on a date with every single person that asked you, you should exhibit a certain level of particularity when it comes to where you commit your time. A good rule of thumb is whether the opportunity causes more damage than potential good: if it could hurt your brand or your soul, don’t accept it. Most readers will be able to spot such instances a mile away. However, the trickier moments in life are when to say no when it seems like you should maybe say yes. According to Dan Schulman, after Obama lost the race for Congress in 2000, he interviewed for a job running the prestigious and progressive Joyce Foundation in Chicago. It would have paid mid-six figures and included other perks such as a country club membership. If an opportunity is dropped in your lap but it doesn’t mesh with your core instincts, you owe it to yourself to say no. Your Time is Always Finite. Your commitment to excellence requires that you say no as there are a finite number of hours in the day and always will be. Time does not allow you to say yes to everyone: sure, you want to serve on the board of that worthy non-profit, or mentor that very deserving underprivileged kid, but if you want to continue all the numerous other tasks you are committed to with the excellence that you have connected to your brand and your name, you must say no. It doesn’t make you a bad person. It makes you a master strategist. Do you remember the period before you were successful? Maybe this was when you were a student or a struggling entrepreneur, or working a job you hated. This was a time in your life when you weren’t inundated with invitations to dinners, talks, cocktail parties, screenings, or panels. While all such events are (sometimes) incredibly worthy and can often enrich your career and your network, you can’t and shouldn’t attend all of them. Back when you were at the start of your career and had a much smaller social network and fewer events to go to, you also had more silence. You had more time alone with yourself to think about your ideas and to tinker with your own creativity, innovation, and imagination. This is my theory as to why the second album a band puts out often is subpar. The first album was made after much reflection and effort. When the first album and the band takes off in a whirlwind, it often doesn’t give the band the time and space it needs to recreate that magic in the second album. You have to say no occasionally in order to honor times when you can just be alone and silent with yourself and your ideas. Saying no comes from a place of strength and wisdom. It indicates that you know yourself, that your goals are crystal clear, and that you have the courage to assert boundaries. Sometimes saying no to a brilliant opportunity, a fun social event, or a worthy mentee means you’re shouting an even bigger yes to yourself, your goals, and your future. Uber has settled with the family of a pedestrian who was killed when one of the company’s self-driving cars hit her while she crossed a road in Tempe, Ariz. earlier this month. A lawyer representing the family of the deceased victim, Elaine Herzberg, told Reuters on Thursday that “the matter has been resolved,” but she did not reveal the settlement’s terms. An Uber spokesperson declined to comment to Fortune about the settlement. Herzberg was struck by one of Uber’s autonomous vehicles on the night of March 18 as she crossed a busy street while pushing her bicycle. Although a human driver was inside the self-driving car as a precautionary measure, a video of the accident shows the driver looking down until seconds before Herzberg appeared in front of the car, illuminated by the vehicle’s headlights. Local police told Fortune that the car was operating in autonomous mode when the accident occurred. The accident is believed to be the first fatality involving a self-driving vehicle, an area in which several big companies like Alphabet (goog) subsidiary Waymo and General Motors (gm) are heavily investing. After the accident, Uber paused all of its self-driving vehicle tests, including in California, where the online ride-hailing company is based. By avoiding any future civil litigation over the accident, Uber has dodged the possibility of the courts establishing a legal precedent over liability in autonomous vehicle accidents. A recent New York Times article highlighted problems with Uber’s self-driving car program, in which human drivers were more likely to take control of the autonomous cars during tests compared to rival companies. Additionally, a Reuters report published earlier this week revealed that Uber removed the number of lidar sensors from its newer fleet of self-driving cars. These sensor are used to help the cars “see” objects in the road, and reducing the number of sensors could have created more blind spots than Uber’s earlier test fleets as well as those of its rivals, the report said. WASHINGTON (Reuters) – Amazon.com Inc (AMZN.O) shares fell almost 5 percent on Wednesday, wiping more than $30 billion off its market value, after news website Axios reported that U.S. President Donald Trump is obsessed with the world’s largest online retailer and wants to rein in its growing power. Amazon’s stock, which fell as low as $1,386.17 on Wednesday, was last down 4.6 percent at $1,427.83. The shares have nearly quadrupled over the last three years. Tech stocks have been under pressure after Facebook Inc (FB.O) acknowledged this month that user data had been improperly harvested by a consultancy. Is GE Now A Good Value? About a month ago, I talked about 4.00% being the magic number for General Electric (GE) in a number of ways. One of those ways was the annual dividend yield, because the stock’s fall was putting this number in play. Despite a huge market rally on Monday, GE shares actually declined, with the stock less than 75 cents from this key dividend level at the day’s low. Will this be the point at which investors see value from the name again? Last September, the board declared a $0.24 quarterly dividend, at which point the forward yield was 3.95%. Unfortunately, this became a misleading number for GE because as the stock fell, more and more concerns built up about a dividend cut, so it was hard to use that payout rate to project a yield. Things reset in early December, when the current rate of $0.12 was declared, and the chart below shows how that yield has fared on a closing basis since. With shares hitting a low of $12.73 on Monday, the annual yield was up to 3.77%. As you can see below, even after GE shares bounced a little into Monday’s close, the current yield is well above even the longest dated US Treasury. Looking purely at income potential, GE represents a better play moving forward if you believe the payout remains at its current level. The odd part about Monday’s decline for the stock was that the market soared, with the Dow up almost 670 points on the day. There wasn’t a major catalyst that sent GE shares lower, outside of the Wall Street Journal worrying a little about about risks left over from the company’s once massive lending business. Even names like Facebook (FB) and Tesla (TSLA) that have seen plenty of negative news recently managed to go positive by the close, something that didn’t happen with GE. With the stock doing so poorly lately, and nobody sure of what will happen with the business moving forward, it might not be a surprise that JPMorgan slapped a street low $11 price target on the name a few weeks ago. This was based on the notion that normalized free cash flow per share looks to be well below the street consensus, and we’re not even at a trough. On the flip side, there are those arguing for plenty of upside for the beaten down name, with Melius Capital stating that a breakup likely undervalues the business by 25% or more than previously estimated. The question for investors is does GE now become a value play? Well, that likely depends on what you think of potential earnings. 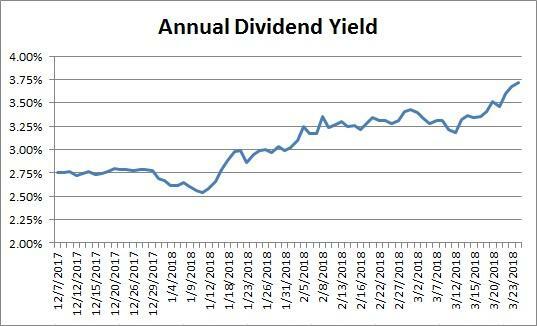 If you think that the street’s projection of $1.06 in 2019 is fair or even low, then a forward P/E a little north of 12 with a dividend yield of 3.7% seems like a decent value at roughly half of the S&P 500’s current trailing P/E ratio. However, if you think the situation will get much worse and earnings per share could fall as low as say 80 cents next year (a bit worse than street low of $0.85), a P/E above 16 currently is a bit harder to stomach in a declining revenue/earnings scenario. With GE shares hitting another low on Monday despite a tremendous market rally, I’m wondering today at what point investors will consider the name a value. Will it be the 4.00% annual yield that the stock is fast approaching? With a forward P/E in the low teens, the name is certainly not expensive if you think management can get the business going again, but again, a cheap stock can always get cheaper if the situation worsens. Do you see value in General Electric currently? I look forward to your comments below. WASHINGTON (Reuters) – Facebook Inc (FB.O) shares fell as much as 6.5 percent on Monday after the main U.S. consumer protection regulator said it was investigating how the social network allowed data of 50 million users to get into the hands of a political consultancy. Scrutiny by the U.S. Federal Trade Commission, which generally confirms the existence of an investigation only in cases of significant public interest, adds to pressure from lawmakers in the United States and Europe for Facebook Chief Executive Mark Zuckerberg to explain how his company handles user data. Facebook shares briefly dipped below $150 on Monday for the first time since July 2017, before recouping some losses. They were down 3.1 percent at $154.37 in afternoon trading. At the day’s session low the company had lost $100 billion in market value since March 17, when newspapers first reported that Facebook member data was improperly used by consultants Cambridge Analytica to target U.S. and British voters in close-run elections. The investigation is broader than looking into whether Facebook violated a 2011 consent order it reached with the FTC over its privacy practices, a person briefed on the matter told Reuters. The FTC’s move to make its probe public comes as lawmakers in the United States and Europe put more pressure on Facebook and Zuckerberg to explain the company’s privacy practices. The U.S. Senate Judiciary Committee said on Monday it had invited the CEOs of Facebook, Alphabet Inc (GOOGL.O) and Twitter Inc (TWTR.N) to testify at an April 10 hearing on data privacy. A bipartisan coalition of 37 state attorneys general also wrote to Facebook on Monday, demanding to know about the company’s role in the manipulation of users’ data by Cambridge Analytica and its policies and procedures for protecting private data. Earlier in the day in Europe, the European Union Justice Commissioner asked Facebook if the company is “absolutely certain” that the Cambridge Analytica incident could not be repeated. U.S. auto parts retailer Pep Boys suspended all advertising on Facebook on Monday while consumer electronics company Sonos said in a blog post it will remove advertising for its speakers from Facebook, Instagram, Twitter and Alphabet’s YouTube for one week. Internet company Mozilla Corp, Germany’s second-largest bank Commerzbank AG (CBKG.DE) and British advertising group ISBA all suspended advertising on Facebook last week. SINGAPORE (Reuters) – Ride-hailing firm Uber Technologies Inc [UBER.UL] has agreed to sell its Southeast Asian business to bigger regional rival Grab, a source with direct knowledge of the matter said on Sunday, in what would be the U.S. company’s second retreat from Asia. The deal, which could be announced as early as Monday, marks the first big consolidation in the industry in Southeast Asia, home to about 640 million people, and will put pressure on rivals such as Indonesia’s Go-Jek, backed by Alphabet Inc’s Google and China’s Tencent Holdings Ltd .
As part of the transaction, Uber would get a stake of as much as 30 percent in the combined business, the source said. He did not want to be identified as the deal is not public yet. Uber and Singapore-based Grab, Southeast Asia’s biggest ride-hailing firm, declined to comment. A multi-billion dollar investment in Uber earlier this year by Japan’s SoftBank Group Corp , already one of Grab’s main investors, had stoked expectations that Uber would consolidate its Southeast Asian business with Grab. Grab’s deal with Uber would be similar to the one struck in China in 2016, when Didi Chuxing bought out Uber’s China business and handed over a stake in return. During a visit to India in February, Uber Chief Executive Dara Khosrowshahi had, however, pledged to continue investing aggressively in Southeast Asia, even as the company expected to lose money in the fast growing market. Both Grab and Uber have raised billions of dollars from global investors to fund their expansion plans, as they offer heavy discounts and promotions to attract both riders and drivers. Grab raised about $2.5 billion last July from Didi, SoftBank and others in a deal valuing the company at around $6 billion. Bloomberg first reported the deal. Elon Musk just joined the #deletefacebook movement as he removed Tesla’s and SpaceX’s pages from the website. The two pages had a combined total of about 5 million ‘likes’. Musk not-so-subtly announced his decision on Twitter by asking, “What’s Facebook?” in response to a tweet calling to delete the social media platform. Another Twitter user asked, “this should be deleted too, right?” with a picture of the Tesla Facebook page, to which Musk had a cheeky response. Facebook has been under fire over the Cambridge Analytica scandal, which gave away 50 million people’s private data. Last month, Tesla’s Amazon cloud was hacked to mine cryptocurrency. The hacker remains unknown. Plus, this isn’t the first time Facebook has done something unethical to its users. Back in 2014, Facebook manipulated its users’ news feed to show positive or negative content. Over 600,000 people were unwittingly part of a massive experiment. Tisk tisk, Zuck. I use twitter for news orgs. My Insta has same women as men. What’s up with the phoney PC police axe-grinding? This brings up a good question: why should anyone care who a billionaire tech CEO is following on Twitter? Social media has brought a new age of pettiness and obsession. You can’t log into any account without hearing about the latest pop-culture celebrity drama or Kardashian lipstick color or makeup line. Additionally, excessive Facebook use is linked to depression as people often compare their seemingly boring lives to that of friends. It’s a huge time-waster too. The average person will spent over five years of their life on social media, with Facebook being the second-biggest offender behind Pinterest. Most people wouldn’t dream of deleting a business social media pages with 5 million aggregate followers. Then again, Musk isn’t like most people. Here’s a guy that dropped out of Stanford, taught himself programming and rocket science, and, most recently, sold his own flamethrowers. He’s most famous for trying to colonize Mars and his Hyperloop project aims to send people from San Francisco to Los Angeles in a half hour. Musk has always gone against the grain and done things that nobody else expects. That’s what makes him unique and what is truly admirable. And that, my friends, is something we can all learn from him.